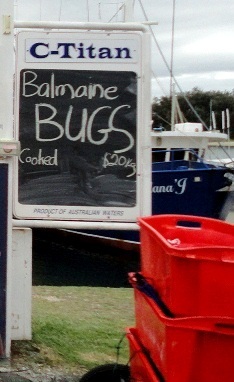 A fresh seafood market is a rarity these days due to the rapid growth of supermarkets across Australia. Even rarer is a seafood market that sells catches off a pier and trawlers. I was glad to find one on the Gold Coast. Located next to glamour hotel Palazzo Versace and opposite 5-star Sheraton Mirage is the Gold Coast Fishermen's Co-Operative. It was one of the early developments on the Spit at Main Beach in 1970. Fresh catches of seafood off the waters of the Gold Coast are brought daily into this tiny pier by a fishing fleet of Prawn Trawlers, Tuna Long Liners and a Spanner Crab vessel, These vessels go out to sea and return to port every day with a variety of fresh seafood which anyone can buy direct from the boat. Best way to get your hands on the affordable seafood is to be there when the boats come in and start retailing at 7am as the seafood is while stock lasts. Even if you're not buying, its still a fun place to bring the kids and learn about the Coop and seafood. The pier and surrounds is also an excellent location to enjoy a romantic sunset over the Broadwater with the bopping trawlers in the foreground.